Or you like most didn’t really care what them ol niggahs were doing cause they making money either way no one could escape being inundated with the feud. 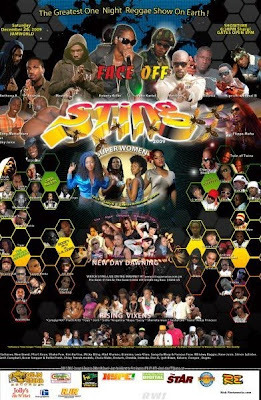 Unfortunately for the Sting promotion team the President was getting tired of all the foolishness, and at West Kingston Jamboree the Gully/Gaza Lords put away their differences (for now anyway). So Dudus did what the Broadcasting commission (Radio Nazi), Bruce and all his kings’ men and every other morally upright group in Jamaica couldn’t do, which is to put the music together again. Well loosely anyway, why again them want to extradite him when he gets the important things done? Clash done, Kartel and Mavado go to Jamaica house and agree to a five point initiative which includes a Paint out day, Happy gully/gaza t-shirt day to replace the buttons the future taxi men and bus conductors presently wear depicting Kartel and Mavado as real killers. There is talk that this peace is not one that the Warlord has sanctioned. Hence the Warlord is still on the Warpath for the “Ungrateful Hell Boy.” Unfortunately Vybz Kartel says No Mas. What’s left for Sting this year, LA Lewis Vs Goofy and Sky Juice Vs Tony Matterhorn? So now it’s the 26th don’t expect a Sting review cause I’m not going. Ill be at Flash brought to you by the Utopia people. Where I am certain at no point in any conversations I will have there will include the phrase “Gaza Mi Say!” nor will I use Goodaz as noun, pronoun, verb and adjective for the entire night.